These are +P rated rounds! 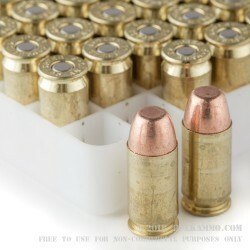 The .45 ACP has long been the premier self-defense round in the United States since its original adoption in 1911. The Speer 200gr .45 ACP +P Total Metal Jacket is the next evolution of that time honored heritage, and will leave you wishing you had made the change sooner. The Speer 200gr .45 ACP +P TMJ features Speer’s total metal jacket bullet engineering, creating one of the most unique .45 caliber rounds anywhere in the world today. 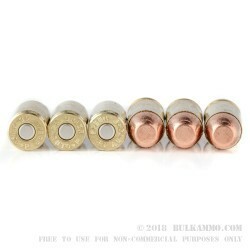 Unlike traditional full metal jacket ammunition that leaves the base of the lead core exposed on every round, the Speer total metal jacket houses the entire lead core within the copper jacket. This both decreases airborne lead particles indoor ranges, and prevents deformation of the rounds lead base upon ignition of the primer. Resulting in a more aerodynamic, more accurate flight path. 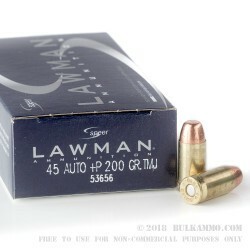 Higher chamber pressures of the Speer 200gr .45 ACP +P TMJ greatky increase velocity and penetration, and at an average velocity of 975 feet per second, the round nose flat point round has one of the flattest tragejortics of any .45 on the market today. 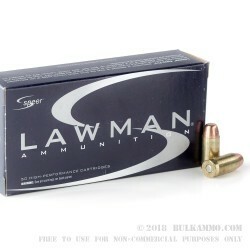 Shooters looking to take the skills to the next level need look no further than the Speer 200gr .45 ACP +P TMJ. A: Hello Terry, Speer lists the muzzle velocity of this round at 1080 fps. A: Hello Jared, Speer lists the muzzle velocity of their 200 grain TMJ bullet at 975 fps.